Not long after taking the Exam, when I was given the preliminary result of a passing grade, I received confirmation in the mail from the USPTO affirming that I had indeed passed the Patent Bar. I also received a notice that I was going to be listed in the USPTO gazette (here) as a potential patent agent candidate who had officially passed the Registration Examination. Anyone who had any interest in my status as a patent agent was invited to provide feedback to the USPTO concerning my character, particularly if someone had a reason to think I would not act ethically with the vast powers granted to a patent agent. From registration fees to a typo on the official certificate, read about Chris’s experiences in his latest post! Q: I know nothing about patent law. Is your Bar Review Course suitable for me? A: Yes. Our materials are designed with the express purpose of assisting you in passing the USPTO Exam, but it is our goal to teach you patent law in the process, so that once you pass, you will be an effective patent attorney or agent. Q: How do I register to take the Patent Bar Exam? A: Please visit the USPTO’s Office of Enrollment & Discipline website. Once there, select “Examination Registration.” This site will answer any and all Exam-related questions, including requirements to sit for the Exam and how the Exam is administered. Q: What does the Classroom or Video Bar Review Course tuition cover? A: The Course tuition covers all lectures and instructional materials; for the Classroom course, it does not cover travel expenses, hotel accommodations or meals. We do, however, provide morning and afternoon refreshments at the Classroom Course. Shipping within the continental US and Canada is included in the tuition price; overseas purchasers incur an additional shipping cost (please contact our office via email: registrar@patentresources.com, if you are an overseas purchaser). Q: What is the difference between the Classroom and Video Bar Review Courses? A: With the Classroom Course, you attend five days of lectures in a live classroom setting. The Video Course consists of approximately 40 hours of lectures via our Video on Demand player. The printed materials for both Courses are the same and both provide access to ExamWare™. Stay tuned for more questions and answers on the Patent Bar Exam and PRG Patent Bar Review course! 14 Outstanding Patent Law Courses – Join us in Florida for PRG’s Spring 2012 Advanced Courses! PRG’s Spring 2012 Advanced Courses Program is almost here! 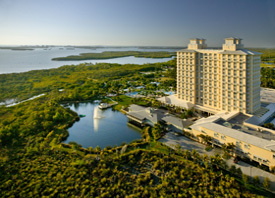 We will be in Bonita Springs, Florida from March 25-31, 2012, and we hope you can join us and hundreds of your peers. Hyatt Regency Coconut Point Resort and Spa in Bonita Springs, FL. PRG’s Spring 2012 Advanced Courses program provides the perfect opportunity for you to get the professional training you need and to keep current with the latest developments in patent law. And it is not too late to register for your courses! So join us in Bonita Springs, FL on March 25-31, 2012 at the Hyatt Regency Coconut Point Resort and Spa! “Passing the Patent Bar with PRG” aims to help aspiring patent professionals locate useful courses, resources, and advice that will guide them during the study and registration process for the Patent Bar Exam. ”Passing the Patent Bar with PRG” isn’t the only blog out there written by and for patent law professionals, though. An entire network of patent law blogs exist, and this network can provide useful news, analysis, and networking opportunities for new professionals in the intellectual property law field. Here is a quick list of 10 excellent blogs for patent professionals. Learn How PRG Will Pay your $100 USPTO Patent Attorney/Agent Registration Fee! You must sit for the patent bar exam within 5 months of the date of the purchase of the video course or within 5 months of completion of the live course. If you purchased both the live and the video courses together, the 5-month window starts with the completion of the live course. If you add the video or live course to a previous purchase, the 5-month window will restart with the subsequent purchase. This offer is only available to full-price, student price, and government/military purchasers. You must submit to us a copy of the letter from the USPTO indicating that you passed the exam, along with the completed Applicable PRG Form. If you have questions, please forward to registrar@patentresources.com or call 703-682-4860. Learn about other special offers from PRG! Finally, you can have Patent Resources Group’s courses taught on-site at any of your locations. The training is customized to meet your specific needs. To find out more about customized on-site training from Patent Resources Group, please call or e-mail Ted Klekman at (916) 404-3908 or tklekman@patentresources.com. Join us in Florida for PRG’s Spring 2012 Advanced Courses! Hyatt Regency Coconut Point Resort & Spa in Bonita Springs, FL. PRG’s Advanced Courses provide the perfect opportunity for you to get the professional training you need and to keep current with the latest developments in patent law. All of our courses have been updated to reflect the impact of relevant new case law and other developments at the USPTO and the courts, as well as any changes needed to reflect the impact of the America Invents Act (AIA). We’re also offering a special one-day course, focusing entirely on the AIA, that every practitioner needs to take. Get a special rate of only $495 for the AIA course if you also sign up for a three-day course at this program!